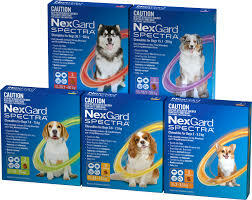 Nexgard Spectra is an all-in-one monthly tasty beef flavoured chew that protects against heartworm, fleas and intestinal worms* (hookworm, roundworm, whipworm). It is suitable for use in puppies over 8 weeks of age and over 2kg body weight. It is available for purchase in single doses, 3 month or 6 month packs. Packet sizing ranges from 2kg up to 60kg. *Tapeworm protection is not included, this wormer is sold separately in clinic.